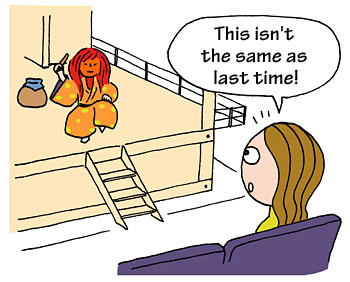 TRIVIA of Noh : Q61 : Are Noh performances always the same? | Home | Trivia | Q61 : Are Noh performances always the same? Are Noh performances always the same? Historically there has been an accepted standard performance for each Noh play. These standards are called tsune, or “usual.” However, there are many performances that differ from the tsune, which regardless of how much they differ are known as kae, or “changed.” While still traditional arts, through the different performance styles, the impression given by an individual Noh performance can changes greatly, giving Noh a multifaceted attraction. Among the variations, kae that required special training are known as narai, which are indicated in the program to the side of the play’s title as kogaki. Certain other broad variations besides narai are also indicated as kogaki. From this, a series of special performances have also come to be called kogaki. Special kogaki performance include broad changes such as the masks and costumes of the shite, waki and kyōgenkata, sets and props, stage, dance and hayashi. Narai indicated as kogaki are not simply a different style of performance, but a more serious type of play. It is good to take into account how the kae and kogaki version differ from standard performances when enjoying Noh. In addition to the traditional kogaki, there are also new, original performance style. Judging their quality can be another form of enjoyment.